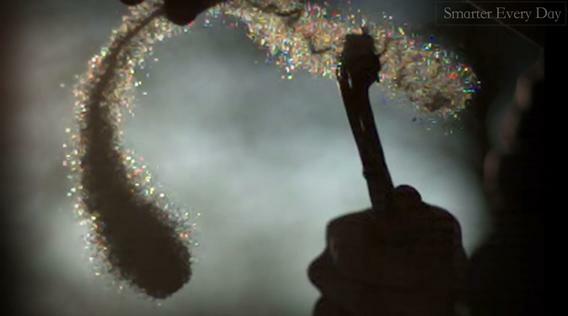 Prince Rupert’s Drops: Glass droplets exploding. I was reading one my favorite science blogs, It’s OK to Be Smart, and was amazed by a video about something I’ve never seen or even heard of before: Prince Rupert’s Drops. These are tear-drop-shaped glass blobs with long, thin tails, made by dropping molten glass in water. They’re interesting, but when you try to shatter them, they become holy-cow-where-has-this-been-all-my-life amazing. The video is from the remarkable Smarter Every Day video series. This is one of those rare times I don’t really need to explain anything; the host does a great job taking care of that. Watch the whole thing. It’s truly cool. How about that? Glass is a fascinating subject, but I literally had no idea about this. So look at that: I learned something, and it’s OK to be smarter every day.